A Pessimist Is Never Disappointed: Captain Beefheart R.I.P. Last Christmas, my Hong Kong vacation was interrupted by the sad news that Rowland S. Howard had died. This year the sad news is that death has claimed Don Van Vliet, better known as Captain Beefheart. The thing with Beefheart is that his career was so long that there's room for a fan like me -- someone who first heard the Captain on Ice Crow for Crow (1982) as a teenager after seeing the guy on Letterman's show -- and room for people who got into the guy and his work in the late 1960s. Beefheart always got lumped in with Frank Zappa but, for me, Beefheart was more of a poet than a musician. Every permutation of Beefheart's Magic Band had some outstanding players in it, but it was the Captain's poetry -- his beatnik delivery and old rock-n-roll shout -- that kept things rolling. Add to that, that he had the good sense to retire from the music world and not stage some money-making cash-grab reunion or revival show. That always impressed me. 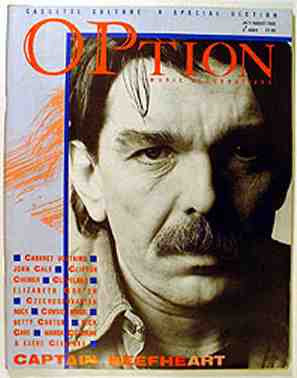 I'm posting the pic of the Captain on the cover of the much-missed Option magazine as it reminds me of an era when it seemed like there was more music to discover and it was more fun in a pre-internet world. Finding an album like Doc at the Radar Station (1980) on import cassette was a thrill.